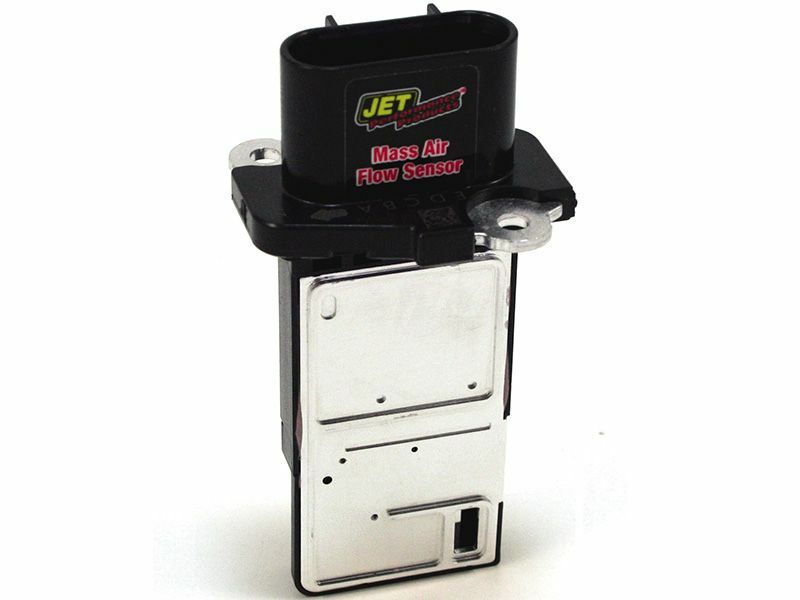 Get added power and airflow from JET Powr-Flo mass air flow sensor. The performance mass airflow sensor replaces your OEM sensor and improves on mileage and can increase horsepower by 13. This performance MAF sensor increases airflow by up to 45% and low-end torque. The power flow sensor is a huge upgrade from the stock unit, and it works great with all factory electronics. Also the Powr-Flo MAF works amazingly with mods like performance chips, modules, exhaust and air intakes. Installing the Jet Powr-Flo mass air sensor is so easy, taking no more than 10 minutes to remove the OEM sensor and replace it with your JET mass air sensor. So if you are looking for a huge boost in performance without breaking the bank. Then look no further! The JET Powr-Flo mass air sensor is perfect for you. Get yours ordered today! All JET Performance Products electronic components carry a Two-year warranty to the original purchaser. All other products and services are fully warranted in defects in material and workmanship for a period of six months from date of purchase. Repair, replacement, credit or refund (at the sole discretion of JET) will be granted on any warranty claim approved in writing by JET. Costs for labor are specifically excluded and are the sole responsibility of the purchaser. This warranty does not apply to products incorrectly installed, modified, or to any product which has been subject to misuse, negligence, or accident. Furthermore, any product used in any kind of competition is specifically excluded. Purchaser assumes all risk and liability whatsoever from any use or misuse of JET products. Upon purchase, purchaser expressly waives any and all liability on the part of its agents, employees, and representatives arising out of any product failure. This extends to all products and/or services sold or otherwise imparted by JET without regard to the involvement of JET in the design, manufacture, sale, and/or use of any JET product or service. Installing the JET Powr-Flo mass air sensor take no more then 10 minutes. If you have any questions about installation please let our amazing customer know.